Cubieboard is a small (10x6cm), hacker friendly, extendable and very low-cost while powerful ARM board with Allwinner A10 SoC. 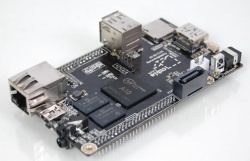 The cubieboard is well represented within the main sunxi developer community and has excellent support both in u-boot as well as 3.4 and mainline kernels. Image creation for ArchLinuxARM (or ALARM) : Cubieboard. Cubietech also has a bunch of official firmwares available on their download page. Generating a HW pack for the cubieboard is easily done with the sunxi-bsp and well supported. Use the Cubieboard build target. Use the sun4i-a10-cubieboard.dtb device-tree binary. Use the sun4i-a10-cubieboard.dts device-tree file for the mainline kernel. The FEL button triggers FEL mode. There is a nice 2.54mm pin header near to the SoC. 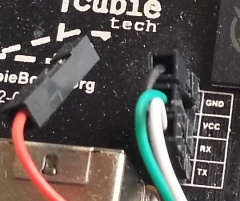 All you have to do is connect the correct wires, according to our UART howto or the Cubieboard TTL howto. Do not connect Vcc as that might damage your board. The cubieboard was a major success, and it has become a name of its own. Therefore, no rebadging has taken place, but there might be some bad chinese rip-offs out there, which carry the same name. Next to the sunxi community, the cubieboard has its own cummunity. #cubieboard IRC channel on Freenode. Click to join via WebChat). This page was last modified on 8 December 2018, at 04:16. This page has been accessed 563,380 times.